There are times when a designer’s life can be hugely frustrating. You come across something that sparks inspiration. You ponder ideas in the bath, on the bus, in the studio. You make the odd thing, you teach something to students who come up with fabulous ideas that you just can’t use because it wasn’t your idea. You have a new version of the original idea, you just start to formulate it into a plan and then WHAM! someone else has already had that idea. Not quite the same idea, but near enough to set you wondering if a)you have no original ideas in your head or b)great minds think alike. Feeling like a) or b) depends rather what mood you are in. I really truly hadn’t seen these two pieces of work until yesterday and today. But really, once I had stopped panicking, I realise that these two rare examples of the use of suffolk puffs is just co-incidental. I haven’t stolen the idea. I was planning something different anyway. It’s just that I didn’t know anyone else was already doing things with them. So I am sticking with the Great Minds theory. I told you a few weeks ago that suffolk puffs were the thing, and I am clearly right! 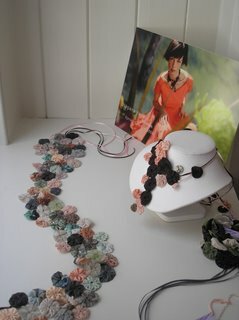 But aren’t these textile jewellery pieces by Dragana Perisic lovely? I’m not so wild about the colours, but the idea is great. Thanks to Style Bubble for this link. The other picture (linked) is from a Japanese craft book. So yes, a designer’s life is full of these ups and downs and moments of self-doubt, but on the whole it is about a million times better than being an arts administrator, organising conferences, writing resource packs, co-ordinating events programmes and suchlike. That is what I was doing just over a year ago, and I am enormously happy to be doing what I am doing. Despite being totally overwhelmed with exhibitions, shows, press mailings and other admin stuff to do, my new work ideas are swishing around in my head and it’s great. I’m really looking forward to promoting and selling my stuff in the next couple of months, but am already thinking ahead to where I am going next year and what I want to achieve in terms of new work by the end of this year. I had a good meeting with my mentor on sunday and it has helped me get my head around how to develop in the future. More on this another time, when it has filtered down into something I can explain coherently! I know exactly what you measn, I make wrist cuffs with puff type things on them, though in making mine I was basing them on old fashioned Scottish tumphy hats. But the puff is clearly the next big thing.